Six days to my 25th anniversary, whoot! Reaching 9 days left on Thursday was the start of my celebrations. For lunch, I treated myself to the new Greek Kitchen restaurant that opened recently. Got spanakopita and baklava and it was delicious! Then for dinner I stopped by Afro Deli. I made a mistake--ordered the veggie fantastic when I meant to order the veggie platter. Had that with fried sweet plantains, and it was wonderful! A fortunate mistake--now there are three menu items there that I really like. Whew, I just finished reviewing and am finally ready! In preparation for my 25th anniversary, I decided to get my Map Mania page rebuilt (friends-locked). It got accidentally wiped out a couple years back, and my latest backup had been from 2008, so it needed a bit of work. Very happy with the final result. Also rebuilt my essays hub that I lost last year, and reviewed all the essays, edited and added bits to some of them. It's now called Essays and Remembrances. I was thrilled Saturday to dig up my box of old writing stuff and get a couple pictures added to my essay on hyarmi appearance and 'Defender Rising.' Also found an in-progress outline of Geren book 3 that was fascinating. And a page from my original 1999 draft of 'Hu-Hov's Debut' with a bit I removed from the story. Now I just need to get my 25th anniversary essays written already! 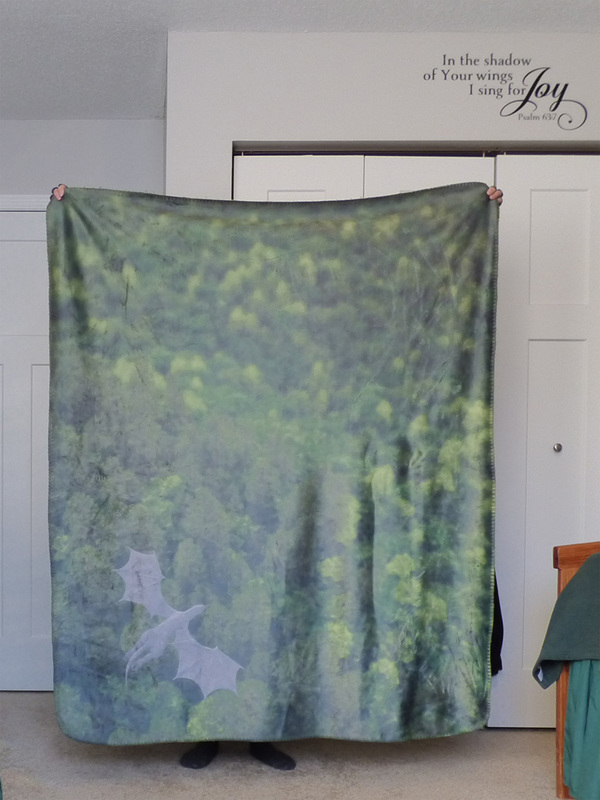 I ordered a Shado-blanket to put over my green chair and it came far faster than I expected! www.personalthrows.com, as always, rocks! The art is called 'Sea of Leaves'--I wanted a more impressionistic effect of the Shado flying over the forest. The blanket is shinier than I expected but incredibly soft and lined with fleece on the back. I'm really happy with how the colors match my lampshades. If I ever have the space and time to refinish my furniture the way I want, the blanket will fit my room design perfectly. Very pleased! In fumbling about with my camera to photograph the blanket, not only did I discover how to set the timer, but I managed to get the macro on. 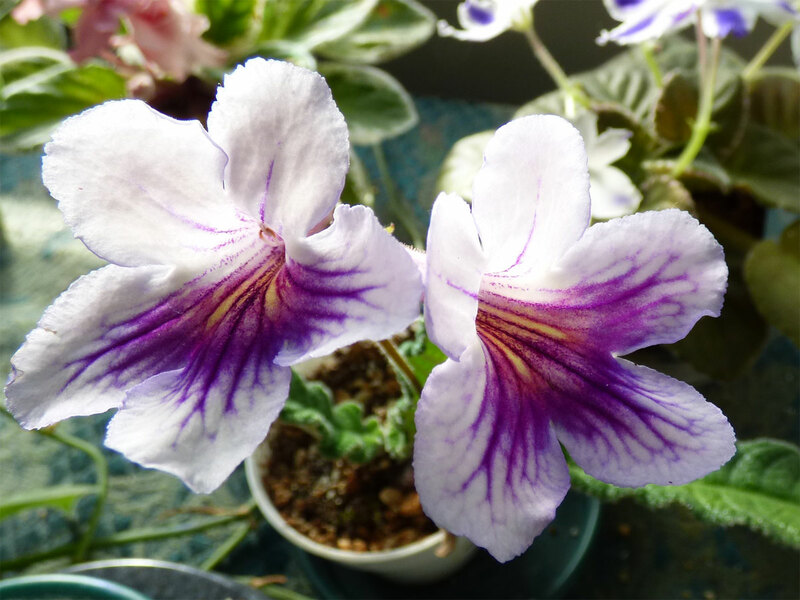 That was a perfect excuse to enjoy capturing my 'Nerys' streptocarpus flowers again. So fun to enjoy flowers in winter! Last but far from least, got started on writing a story Saturday evening. 'Relentless' is the story idea that popped into my head during my time with God on February 11, 2017. So a day shy of a year later, it is underway!